The StrathAyr Track System has been developed with 25 years of research behind it and has revolutionised the track industry. Our track systems give consistent racing conditions in all weather, long-lasting durability and stay thick and lush, year-round with low-maintenance. A StrathAyr track requires less repairs, meaning less closures and more profits. A StrathAyr track provides additional safety benefits for both Jockeys and Horses as it has a consistent surface with less holes or surface damage. There has never been a track related wet weather cancellation on a StrathAyr Track System. Never. We custom-design each track’s drainage system to cope with local climatic conditions, which helps to prevent track closures due to weather. StrathAyr tracks are made with ReFlex® mesh elements, which help the turf to resist compaction and provides a greater extended life of the rootzone profile, meaning turf is healthier, recovers from damage faster and looks thick and lush year-round. Because a StrathAyr track has high load bearing capabilities, a quality drainage system and can cope with all weather conditions, it resists damage better and recovers faster. This means tracks can be used more and maintenance costs are reduced. We lay a track that is resilient and damage resistant. Moonee Valley Racecourse records show the StrathAyr Track System requires less irrigation and has a lower maintenance cost than conventional racing turf profiles. The StrathAyr Track System is significantly more cost-effective than other natural turf constructions. A StrathAyr track profile has an indefinite lifespan, requires less repairs, lower maintenance costs, excellent drainage in wet weather conditions and provides greater usage as a result. ReFlex® mesh technology ensures our tracks have greater surface uniformity and cushion impact, lowering injury potential for both horses and jockeys. In over 20 years of racing there has never been a Fast rating on any of the ReFlex® tracks. The StrathAyr Track System design is the same, in every track and every country. Drainage systems are tailored to the needs of the venue and weather conditions, whilst turf variety is selected based on climate. With StrathAyr you can trust that you are getting the very best system for your specific track. Because of this, StrathAyr tracks always look their best, no matter where in the world they are. The unique application of ReFlex® mesh elements provides the load bearing capability of a secondary bitumen road. This enables horses, trucks and turf equipment to travel over the surface in all weather conditions without damaging the turf. StrathAyr have a dedicated installation team and equipment to ensure the track is installed to the highest standard. StrathAyr have developed specialised machinery and expertise over many years and can offer full design and construction services from start to finish. StrathAyr provides ongoing support for all our projects including a full agronomic consultancy service. The StrathAyr Sports Field System is the product of over 20 years worth of experience and research into providing the best possible turf for sporting stadiums. The durable profile creates a hard-wearing natural grass surface that provides an even and well-cushioned area, increasing safety and performance of players. We begin with an expertly designed drainage system, usually consisting of gravel and pipes, topped with a layer of sand. Above this is the upper rootzone reinforced with ReFlex® mesh elements which creates a resilient and durable profile appropriate for all types of sports. Because we prepare our Sports grounds with care and expertise, our turf installations have an unparalleled surface strength, outstanding drainage capabilities and a grass surface that is extremely resistant to usage or weather damage. This allows for more usage over a longer period of time for sports and events with a high volume of foot traffic such as concerts and festivals. The best turf variety is selected to suit the local climate and usage requirement with minimal maintenance. Wet weather cancellations are a thing of the past with the StrathAyr Sports Field System. Local climate dictates the build of each project’s drainage system so that your sports field will not be damaged or need to close due to weather conditions. We also choose turf varieties that will continue to thrive while reducing water consumption and maintenance costs. 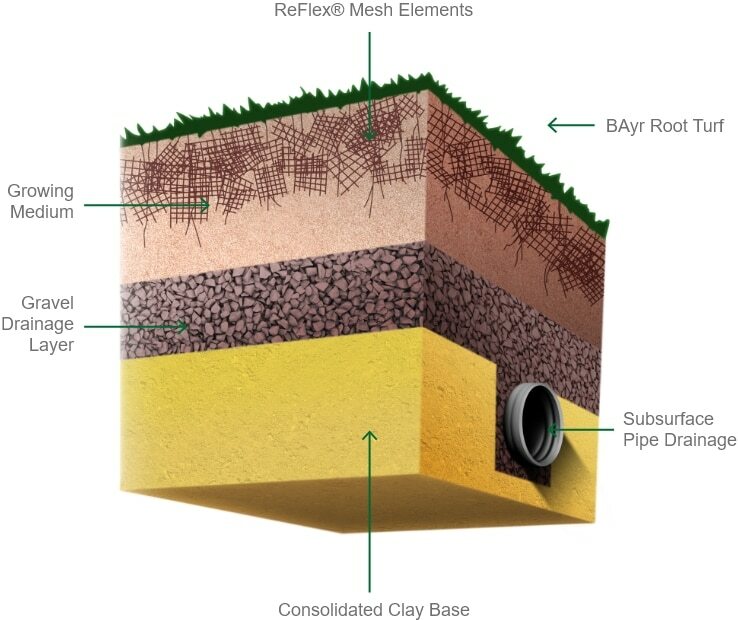 ReFlex® mesh elements extend the life of the rootzone profile, creating compaction resistance for a long-lasting sports turf. The ReFlex mesh elements help to protect the rootzone by distributing load horizontally across the surface area, rather than allowing it to compact down into the roots, causing damage. Host more events and increase returns! Because the StrathAyr system is more resilient to damage, less cost will be needed on maintenance and repairs. Our expertly designed drainage systems also handle all weather conditions, ensuring you will not have to close or cancel an event due to weather. The addition of ReFlex mesh give a high load bearing capability, better wear resistance and faster damage recovery. The technology provides greater surface uniformity and the action of the ReFlex® mesh elements provides a cushioning effect on impact, lowering the potential for injury. No conventional or artificial surface offers an equivalent level of safety. Drainage design and turf species selection are customised for climate and country, but other elements of the StrathAyr Sports Field System’s build always stays the same. The unique application of ReFlex® mesh elements provides the load bearing capability of a secondary bitumen road. This enables equipment or trucks to travel over the surface in all weather conditions without compaction or damage to the turf area.